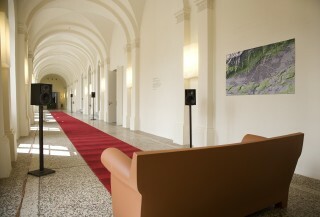 24 sound images in the duration of 30-45 seconds – compiled from a series of recordings of Innsbruck’s sound sphere (2005-2007) are the material of the installation. Three pairs of loudspeakers divide the long “sound space” into beginning, middle and end. Only one pair of loudspeakers sounds at a time. Each sound image, following the direction of space, is repeated twice. architectural form and the materials used. All sounds are “colored” by the installation space. The compositional structure of the work depicts each sound image in its second repetition in the near field. Space sound “masked” by the sound image. as well as the colouring of these through space, presuming, recognising, thinking and musical hearing can arise.